Today I?m excited to share the renovated hall bathroom at the flip house. This is a full bathroom in a single story home which was built in the mid 1980s. When we bought the house it was very dated so I came up with a design plan to give the home and this bathroom cosmetic upgrades for the purpose of resale. The footprint is the same as the original, but the finishes in this space are brand new from floor to ceiling. So that the home will appeal to a wide market of buyers, the style I?m sticking with is transitional. 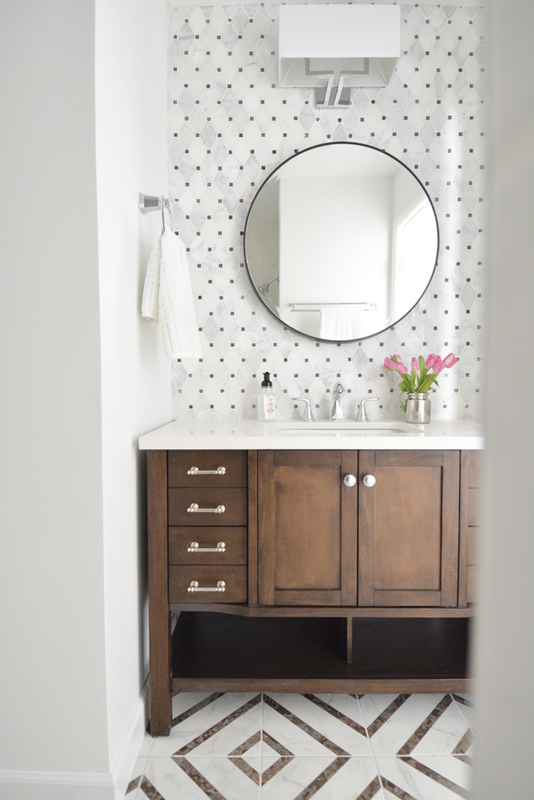 I gave this bathroom a fresh new look and also introduced some pattern on the floor since the rest of this single story home has vinyl plank wood look flooring. (Catch a glimpse of the flooring here and here). I like to mix traditional finishes (like wood and marble) with modern shapes. I kept this windowless space neutral by mixing wood/brown tones with plenty of white. Here?s a look at the remodeled space! The bathroom has a 4? wide niche where the vanity sits, I replaced it with a taller freestanding version. The walls were retextured so that they are now smooth, getting rid of orange peel texture makes a home feel brand new.